Just wanted to stop by and let y'all know we are not lost and gone forever. The team has been super busy with the Holidays and cooking up some fun ideas for the new year. We'll be back to our regular posting and challenge schedule next week!! We have a new challenge at The Latte Lounge this week - anything but a card. The rest is up to you! This challenge will last four weeks and the winner will be announced January 10th. I have two projects for this challenge. The first is a decorated notepad featuring Natalie fromThe Stamping Boutique and papers from JLJ Designs. The notepad was in the Michael's dollar bin. I colored the image with Copics and added a Jolee snowflake sticker. I think this will make a nice Christmas present. I also have some Christmas tags featuring this yummy image from Fresh Brewed Designs. I colored the image with Copics and used Kraft paper and digi paper from JLJ Designs. Rhonda has a make-a-scene challenge until Thursday. Hope to see you at The Latte Lounge! I realized last night that I hadn't drawn a Cynthia in a long time so I decided to do a Valentine image of her. I called her, "I love you this much, Cynthia" I'm still working on that Valentine's Day line! Don't give up on me! LOL! It's cold and snowy here in Indiana. I hope you all have a nice and warm day. Time for the Wacky Wednesday update!! For the past few weeks, participation in the Wacky Wednesday challenges has been pretty low. Considering the fact that there are about 1,000 challenges running online right now, it's understandable! How do you decide which ones to enter? There just are not enough hours in the day to do all the projects I'd like to! Plus, with Holiday Season on us, crafting time is getting even more scarce! hopefully after the first of the year, folks will have a little more time to get Wacky with us!! There are lots of other things to do at the Latte Lounge this week though!! Check out JLJ Designs Digi Paper challenge! Jen's digi papers are some of the best I've worked with! In fact, this project was made with JLJ Designs Candy Cane papers! Pop over and pick up a FREE digi paper and play along with us! Better hurry, though, because it's ending on the 12th!! Rhonda is hosting the "Make a Scene" challenge and Tracey has very generously offered a SUPER collection of Stamping Boutique images that would be PERFECT for this challenge!! And we're still recovering from our Holiday Celebration! We had a GREAT time and there are still 2 challenges from the party just waiting for you!! We're mid-way through Digi Paper Challenge #2- Candy Cane at The Latte Lounge. For this challenge, you can download a free digi paper and use it to create a project. The winner will receive two The Stamping Boutique images AND the Candy Cane digi paper pack. This card uses AJ the Chef from The Stamping Boutique (a great freebie from the chat in the PCP group!) and accent images from Your Next Stamp. I punched a snowflake and flower from the paper pack. I added ribbon and a Merry Christmas tag from Michael's. We have lots of great challenges going on at The Latte Lounge! Our Christmas Celebrationchallenges are open until December 10th. You can trim a tree in Stacie's Wacky Wednesdaychallenge. Rhonda is making a scene and Tracey has posted about a little goodie if you use it for the challenge! This is the weekend!!! There are already some challenges posted and more fun to come. You definitely want to be there tonight from 7-9PM EST for our live to check out all the fun. There will be games, challenges and prizes!!! We'll be chatting in the chat room which can be found right on the main page!! I hope to see y'all there!!!! I can't believe that I forgot to post the blog candy winner! Random.org chose number 87 which is Tanya from Florida. Please contact me to make arrangements for your prize. Hello! It's time again for another challenge at TLL. This time around I would like you to make a scene. You can use any images, papers, punches, embellies you like. The challenge will run for 2 weeks and will end on Dec. 16. The prize will be 2 images of your choice from the TSB store. I hope you'll all join us and play along. 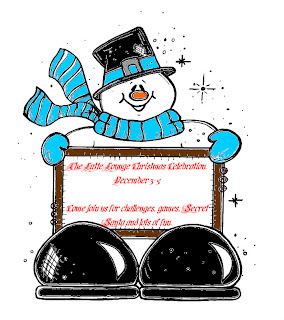 Also don't forget our TLL Christmas Celebration begins tomorrow. You will have until tomorrow morning to sign up for the Secret Santa exchange as I will be handing out the names then. We will be having a chat on Saturday Dec. 4 at 7pm EST/5pm MST with some trivia and maybe a little prize. There will also be challenges to play along with. Hope to see you there. Wacky Wednesday is here again!! There is still a week to play along! It's pretty simple. Print out the Tree FREEBIE image, decorate it any way you like, and post it for all to see! This card was created by our very own Rhonda Miller! She also used "Candy Cane" digi papers from our very own Jen (JLJ Designs). There are THREE challenges running at The Latte Lounge and we'd LOVE to see your creations! 1. Of course, there's Wacky Wednesday, "Trim My Tree"
2. Jen is hosting "Candy Cane" and has FREE digi papers to play with!! 3. Rhonda is hosting "Die Cuts or Punches" til December 2nd! 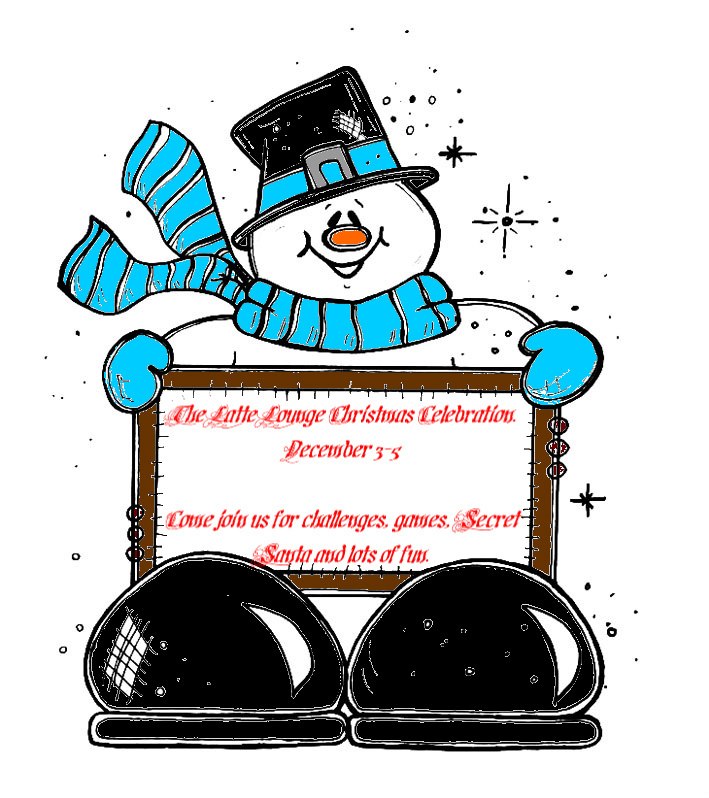 And don't forget about our Christmas Party December 3rd-5th! We'll have challenges and prizes and LOTS of fun! And there's still time to sign up for the Secret Santa Exchange!! And! And! And!! WOW! There sure is a lot going on!!! December 4th from 3-5 EST. and pick up your FREEBIE!! 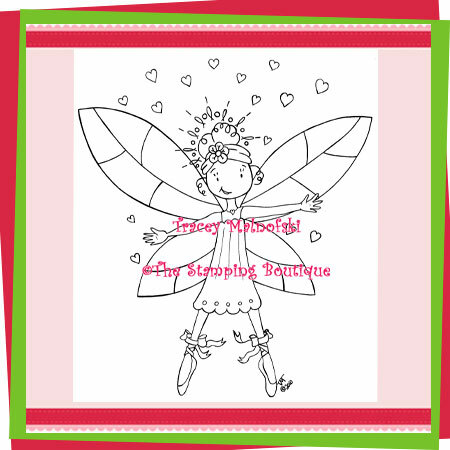 It's a Stamping Boutique Recipe card featuring our Favorite young lady Audrey! The theme is Holiday Sweets and we're all bringing our favorite recipes to exchange! Snag your freebie, pick your favorite recipe and bring it with you to the party! Who doesn't LOVE talking about FOOD and SWEETS!! Yum!! There are going to be FOUR challenges and FOUR FREEBIES!! !